I'm going to brag for just a moment. My dad has a boysenberry bush in his backyard. Right now is their season. last Saturday we went and picked a ton of boysenberries, and I am so happy we did. We also had our organic produce pick up that same day, and in it was fresh lavender. I have a lavender plant, but it is struggling. I lack in the green thumb department. So I was pretty excited to receive fresh, aromatic lavender. I knew all the recipes I wanted to use with it. We also have a lemon tree in our backyard, so all of the plant ingredients in this recipe are organic and fresh. I have to say, being 34 weeks pregnant, you start to experiment with flavors and food. This experiment worked out, at least for my taste buds. I hope you like it too! Set oven to 350. Mix all your ingredients together, in a large bowl, except the lavender. Pour 2/3 high in a greased muffin tin. 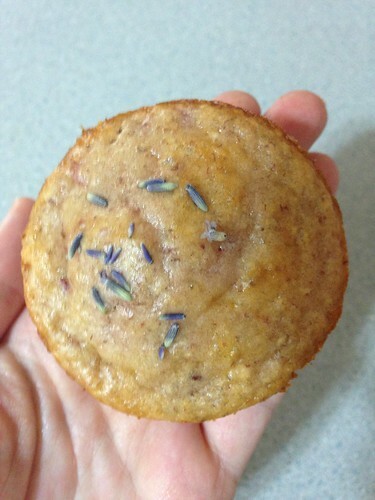 Sprinkle lavender on top of each muffin. Bake for 18 to 20 min. Let cool for 10. This recipe seriously made my day. I loved eating all the components together. Especially when I have a use for my lavender.